_ STEP ONE Do the Relaxation Ritual, the LBRP and the BRH. STEP TWO. From behind your altar (if you have one) face east and perform the Kabalistic Cross from the LBRP. // STEP THREE(a). Go to the east of your area. 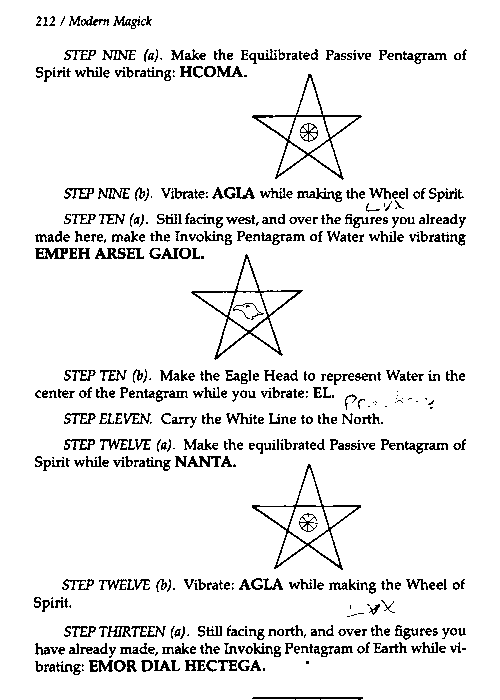 Make the equilibrated Active Pentagram of Spirit As you do so, vibrate EXARP. This should be done so that the last syllable (pey) is sounding after you finish drawing the pentagram. As in the LBRP, inhale, feeling energy come into you, but exhale as you make the pentagram. Be sure to save enough breath so that you can thrust your hands forward into the center of the pentagram while you vibrate the last syllable, "pey." STEP FOUR (a). Still facing east, and over the figures you have already made, make the Invoking Pentagram of the element Air. In the same manner as above, Vibrate: ORO IB AH AOZP while making the pentagram, saving the last syllable to thrust forward and charge. STEP THIRTEEN (b). Vibrate AH-DOH-NYE while making the sign of Taurus. . STEP FOURTEEN. Carry the line to the east, completing the circle. Return to your original position behind the altar, facing east. 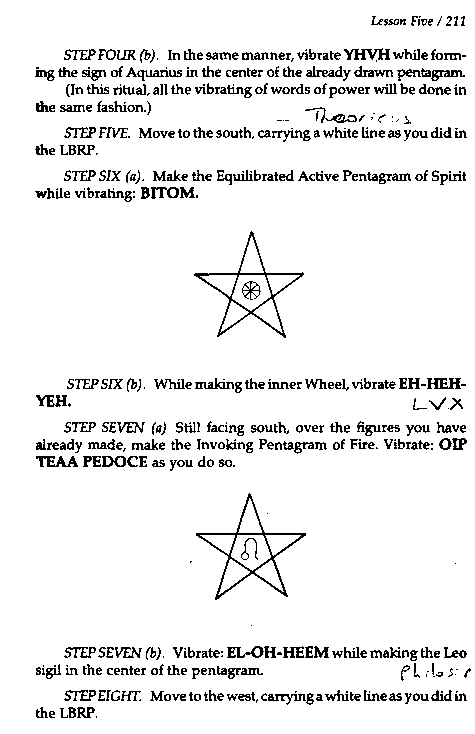 While you are learning this Supreme Invoking Ritual of the Pentagram always end by doing the LBRP. Always! And it will be better if you also do the BRH. NOTES: As in the LBRP, the pentagrams are blue and the lines connecting them are white. The Wheels of Spirit should also be the same brilliant, pure white light as the lines connecting the pentagrams. The Aquarius sign should be yellow to represent Air. The Leo sigil should be red, for Fire. The Eagle symbol should be blue to represent elemental Water. Finally, the Taurus sign should be shiny black to represent Earth. If you were doing this ritual in the form of a banishing ritual you would use the same symbols within the pentagrams. However, the pentagrams would use their banishing forms while the Spirit Pentagrams would use their Closing forms. You may notice that I did not mention a particular tool to use in this ritual. At this time, use the dagger. 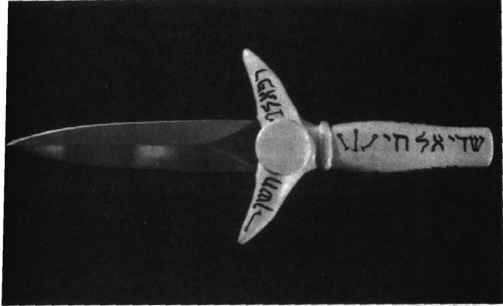 However, as we progress in this course, you will find that one particular weapon is not associated with this ritual as the dagger is with the LBRP. On the following page you will find a review for this ritual. The SIRP should be learned, and preferably memorized, but it is not a part of your daily work. How to make a pentagram with your hands? How to use the SIRP to invoke your guardian angel? When should i use sirp magick? How to invoke angels in a pentagram? How to invoke spirit in pentagram? How to draw Pentagram for rituals? How to use supreme invoking ritual of the pentagram?